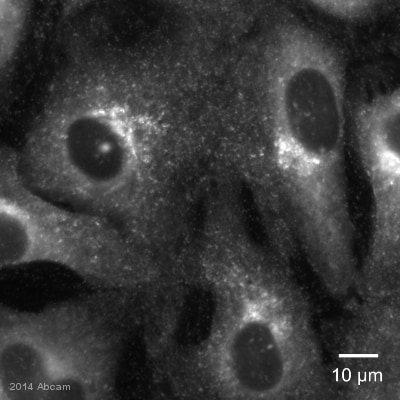 Rabbit polyclonal Clathrin heavy chain antibody. Validated in WB, IP, IHC, Flow Cyt, ICC/IF and tested in Mouse, Rat, Hamster, Human. Cited in 59 publication(s). Independently reviewed in 33 review(s). Synthetic peptide conjugated to KLH derived from within residues 1650 to the C-terminus of Human Clathrin heavy chain. This antibody gave a positive signal in HeLa, Jurkat, A431 & NIH3T3 cells, as well as human kidney tissues sections. ICC/IF: HeLa cell line. Our Abpromise guarantee covers the use of ab21679 in the following tested applications. WB Use a concentration of 1 µg/ml. Detects a band of approximately 180 kDa (predicted molecular weight: 180 kDa). Belongs to the clathrin heavy chain family. Cytoplasmic vesicle membrane. Membrane > coated pit. Melanosome. 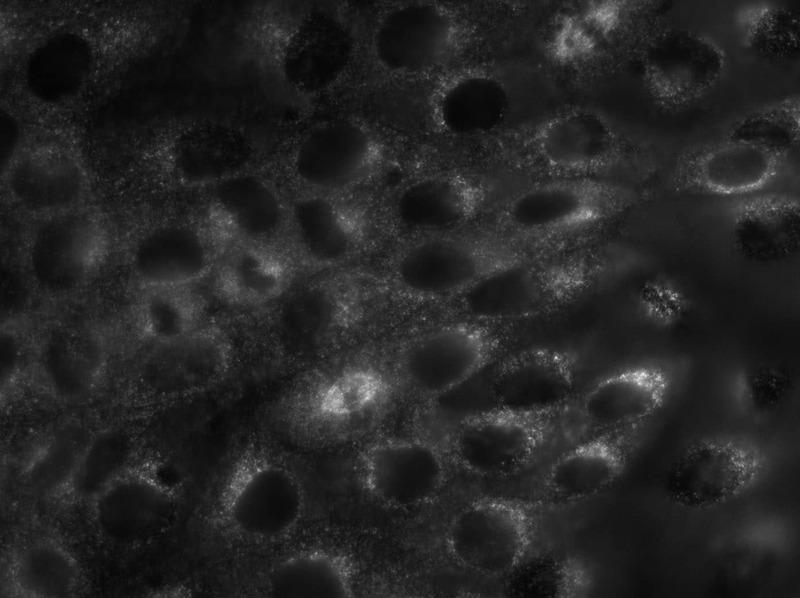 Cytoplasmic face of coated pits and vesicles. Identified by mass spectrometry in melanosome fractions from stage I to stage IV. 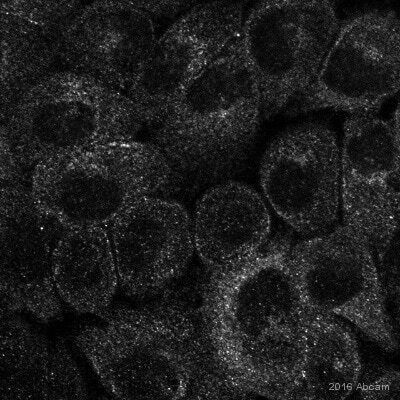 ab21679 staining Clathrin in HeLa cells. The cells were fixed with 10% formaldehyde (5 min) and then incubated in 1%BSA / 10% normal goat serum / 0.3M glycine in 0.1% PBS-Tween for 1h to permeabilise the cells and block non-specific protein-protein interactions. 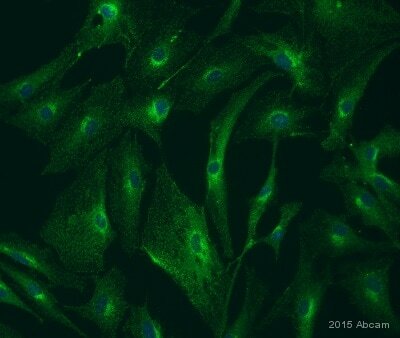 The cells were then incubated overnight at +4°C with ab21679 at 1ugml then detected with an Alexa Fluor® 488 goat anti-rabbit secondary antibody (ab150081) at a 1/1000 dilution (shown in green). 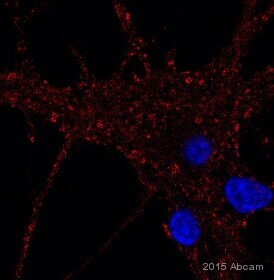 Nuclear DNA was labelled with DAPI (shown in blue), and ab195889, Mouse monoclonal to alpha Tubulin (Alexa Fluor® 594), at a 1/250 dilution (shown in red). 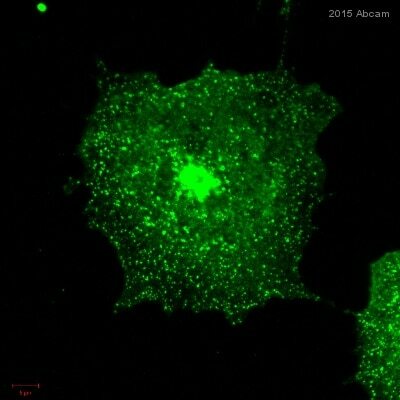 ab21679 staining Clathrin heavy chain in mouse embryonic fibroblasts by Immunocytochemistry/ Immunofluorescence. Cells were fixed with paraformaldehyde and permeabilized with -200C ethanol. Samples were incubated with primary antibody at 1/500 dilution (in 0.1%Saponin/1% BSA/PBS) for 1 hour. An Alexa Fluor®546-conjugated goat polyclonal to rabbit IgG (H+L) was used as secondary antibody at 1/500 dilution. 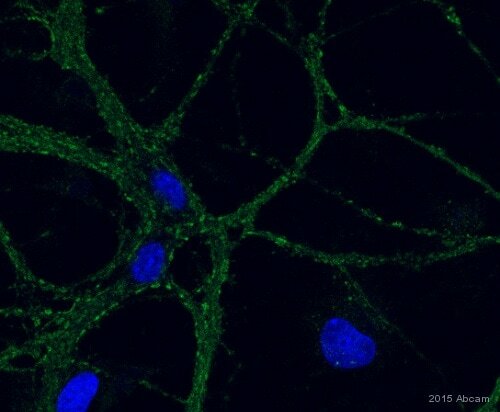 Green color in image show positive staining with Alexa Fluor®546 conjugated secondary. ab21679 staining Clathrin heavy chain in human kidney. Paraffin embedded human (male) kidney tissue was incubated with ab21679 (1/7000 dilution) for 30 mins at room temperature. 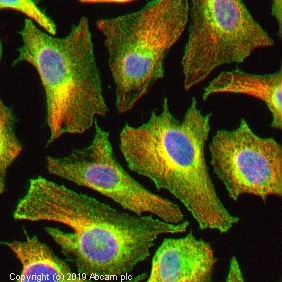 Antigen retrieval was performed by heat induction in citrate buffer pH 6. ab21679 was tested in a tissue microarray (TMA) containing a wide range of normal and cancer tissues as well as a cell microarray consisting of a range of commonly used, well characterised human cell lines. 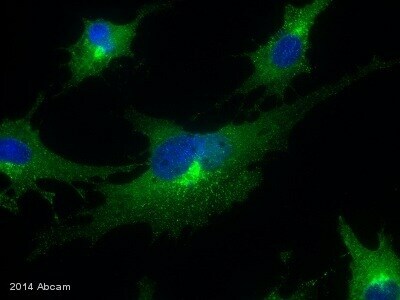 ab21679 staining Clathrin heavy chain in mouse embryonic fibroblast cells by Flow Cytometery. Samples were prepared by homogenization and centrifugation in trypsin and they were washed in PBS. Cells were fixed in 70% 40C ethanol and cell population was gated on Non-junk by FSC/SSC. The primary antibody was diluted 1/2000 in 1% BSA/PBS and incubated with sample for 1 hour at 22°C. 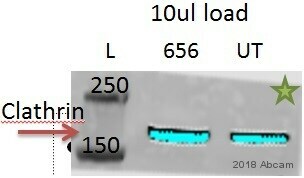 An Alexa Fuor 488 conjugated goat polyclonal to rabbit IgG (H&L) was used as secondary antibody at dilution at 1/500. Publishing research using ab21679? Please let us know so that we can cite the reference in this datasheet.